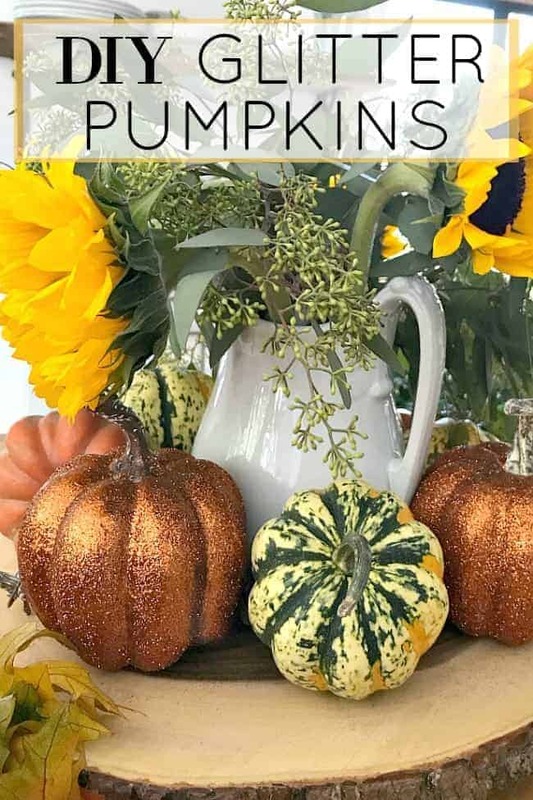 How to make easy DIY glitter pumpkins to add a touch of glam to your fall decor. Before we talk glitter and glam, I want to remind you about my giveaway. We have an awesome giveaway for a $250 Home Depot gift card that is ongoing so if you haven’t entered yet, make sure you head on over. You can enter here. 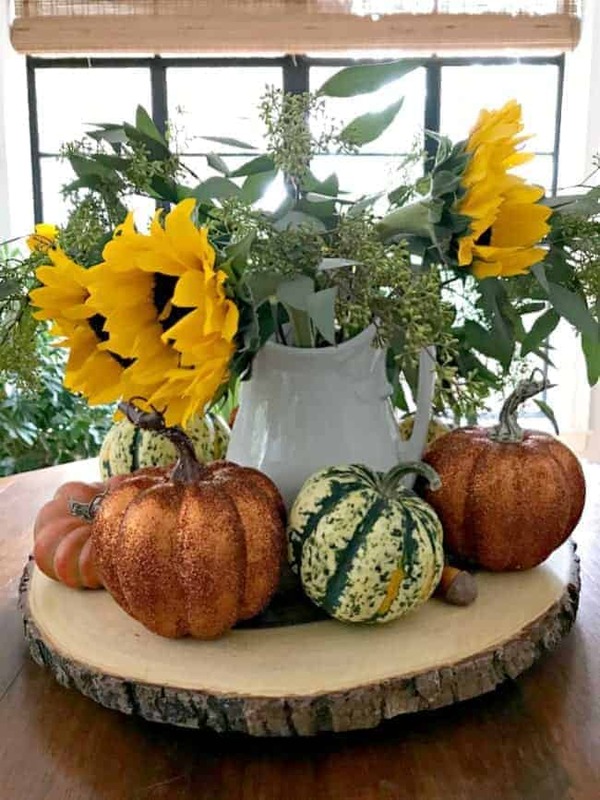 Ok ya’ll, are you ready for an easy fall craft? It seems like I say that every time I share something but this really a is super simple project. 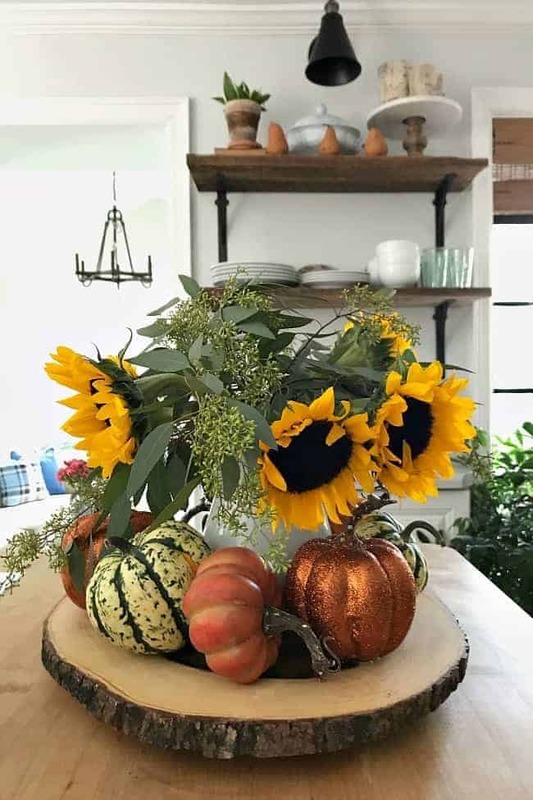 Super simple, but it adds a little touch of glam to your fall decor. So, I have a little confession to make. I have never liked glitter. Never. Everyone in my family knows about this little quirk. We’ve always had an unspoken rule in our house that you didn’t bring glitter into the house, whether it was on a greeting card or decor. I just had this fear thing with the mess. You’d touch it and it would automatically stick with you the entire day. Usually on your face. I just never got the appeal. All was well and I lived a happy, glitter-free life…until a few weeks ago. The hubs and I were in the craft store and I started looking at glitter. Yes, me…the anti-glitter queen. My husband thought I’d gone off the deep end. He just couldn’t believe that I was going to bring glitter into our house…and that I was going to actually make something with it. I shrugged off his teasing and brought it home. 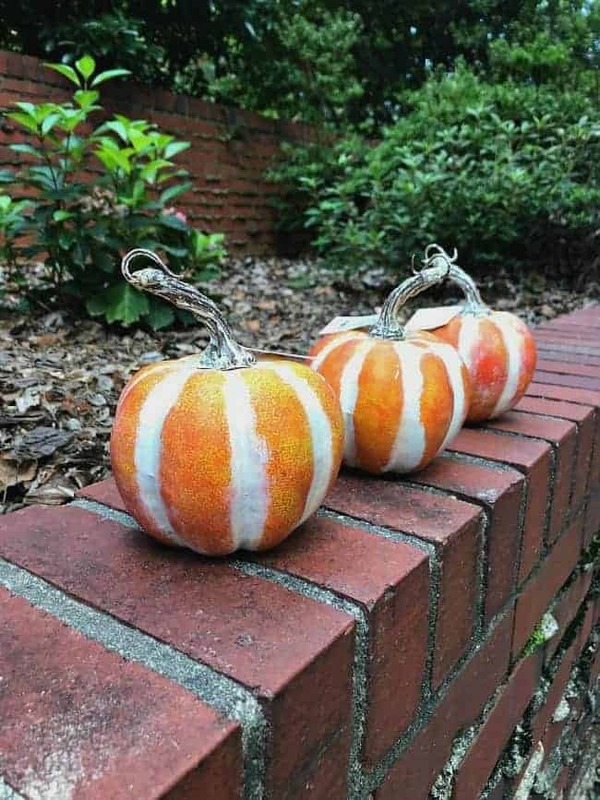 I wanted to glam up some inexpensive faux pumpkins and I wanted to do it using glitter, conquering my fear of it once and for all. I set up my crafting area and took the necessary precautions. I had a moment of doubt right before I opened the little jar of glitter but I didn’t let it stop me. 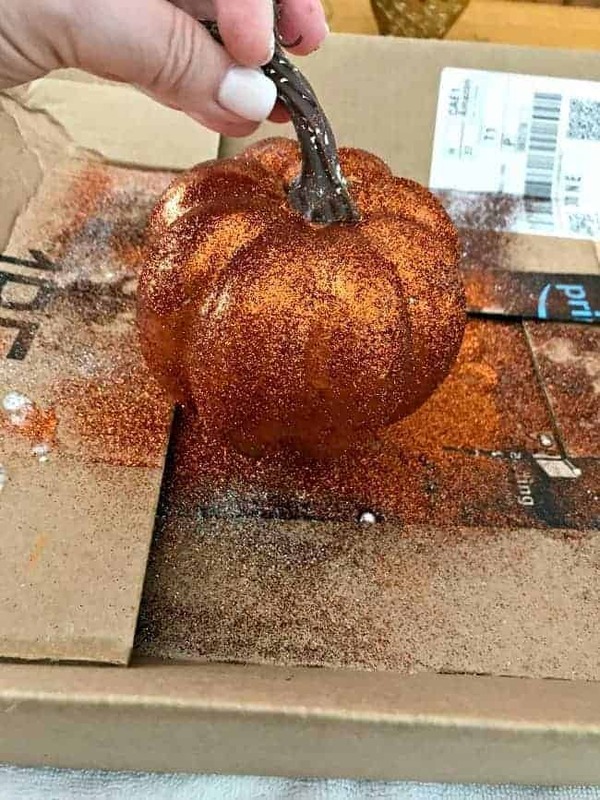 I coated my faux pumpkin with Mod Podge and sprinkled glitter all over it until it was covered. …the house didn’t cave in. I used glitter and survived to tell the tale. 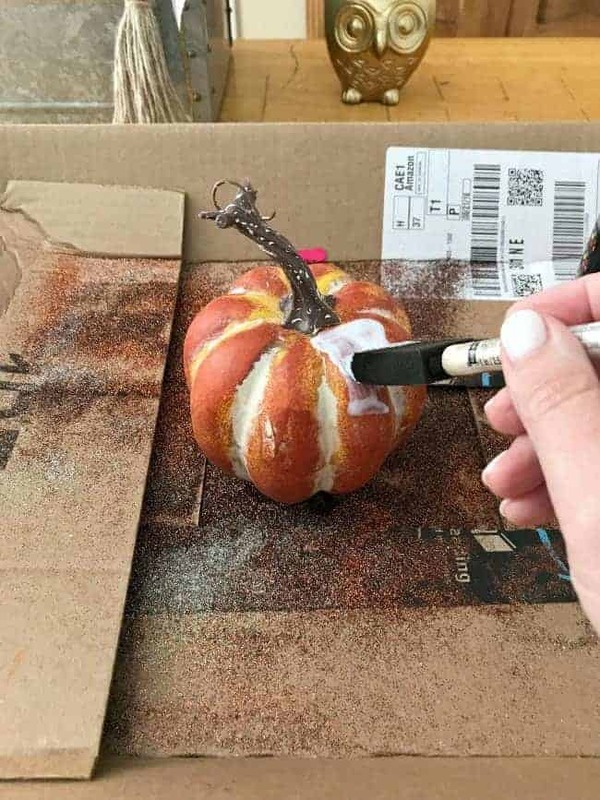 Not only did I use glitter but it was fun, and I loved how they transformed my cheap little pumpkins. 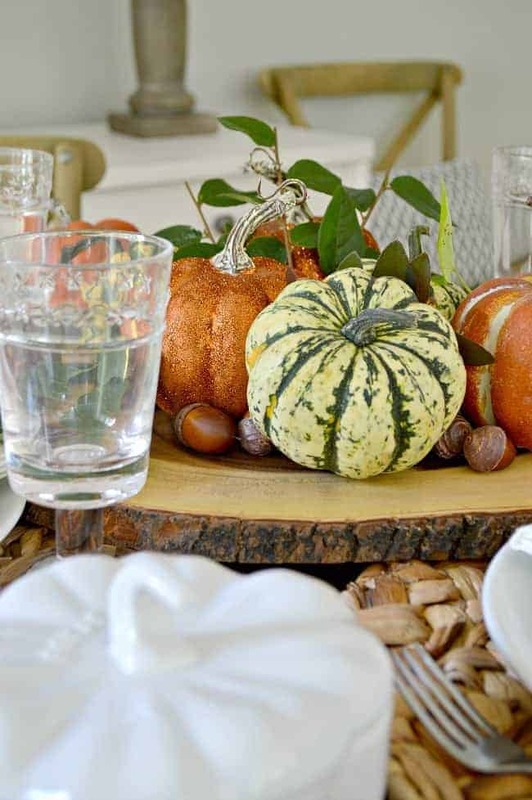 Hands down it’s the easiest way to glam up your fall decor. Will I ever use glitter again? Can my family start buying me cards with glitter? Hey, Rome wasn’t built in a day. So sorry to hear about your fall and the bad weather! People that are not from NY always tease us about how much snow we get, but although by February I’ve had enough of the snow, I know that we can just stay inside and let it snow and don’t have to worry about our house floating away or burning down. Since I’m getting older I worry about falling and having accidents. I still think I’m 20! I know I have to be more careful and I shouldn’t be climbing on the ladder to clean the gutters, but when something needs to be done I hate waiting for one of my sons to come and take care of it. I know their busy with their own families and work. Anyway, hope you are on the mend and it seems you have weathered the storm so that’s good! Take care, my friend! Hi MJ! So nice to hear from you! I hope that you are well and keeping busy. Thanks so much for stopping by. Take care! Thanks so much! I’m starting to change my mind too. I love how the turned out. So pretty, Kristi! Love the copper look! Pinned! I’m not fond of glitter either. As a preschool teacher, I was already informed about the possibility of it getting into young eyes and causing scratches or worse yet, tearing. 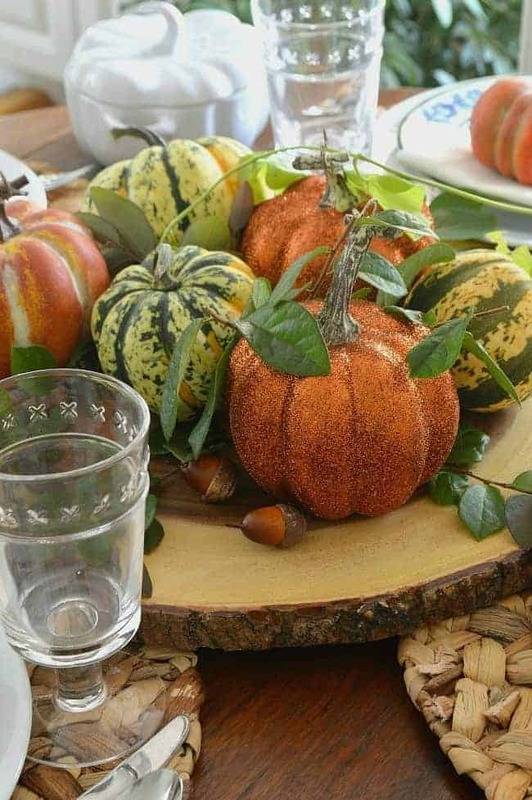 But your pumpkins are so cheery with it! Thanks Sandra! I can see what you mean. Glitter and preschoolers just don’t seem like a great idea. I am not a glitter fan either, but your glitter pumpkins did turn out great! There is a glitter Modpodge and I have used that on Christmas items that I have made. It is a subtle way to add some sparkle. 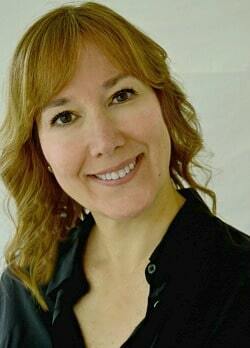 Thanks so much Laura, I love how these turned out. I looked at the glitter Mod Podge but wanted to go full glitter with these (you know, jump in with both feet). 😉 I’ll definitely give it a second look though. Maybe use it for a Christmas craft. Your are so funny. However I am with you. When my daughter was in gymnastics she and all the other girls were glitter queens. It was everywhere. In the car, in the house, in the food. Yuk! I have never been into glam either so when she graduated high school and moved out glitter was band, never to return until I got into mixed media art. I confess to using glitter glue on projects but absolutely refuse to use that loose stuff. Good for you being brave. LOL Have a great week. My girls were never into it, thankfully. It may because I wouldn’t allow it but they never complained. Funny – because I hate glitter too. It’s like cat hair – you’ll find it in places long after the cat/decor is gone. Your pumpkins look great though. Hope it stays on the pumpkins. I’m glad I’m not the only one. My family teases me relentlessly about my little glitter phobia. So far so good with the glitter. It seems to be sticking rather well.